Established in 1945, the Roanoke County Public Library consists of a headquarters library in southwest Roanoke County; three major branches in Glenvar, Hollins, and Vinton; and two neighborhood branches in Mt. Pleasant and Bent Mountain. Conveniently located and service oriented, Roanoke County libraries have an extensive collection of books, magazines, videos, eBooks, DVDs, audiobooks, CDs, and more. The system also provides a full spectrum of library services, from reference assistance, consumer information, and story times for children, to the latest in electronic information, Internet access, computer labs, and public technology instruction. 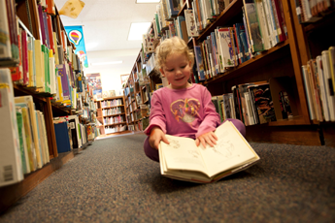 With an annual circulation of more than 1.3 million and annual patron visits exceeding 856,000 per year, Roanoke County Public Library is the busiest public library system west of Richmond. It is also the recipient of multiple statewide awards for innovations in children's programming, special events for adults, and creative promotional efforts. It is part of a larger consortium of public libraries that includes Botetourt County and the cities of Roanoke and Salem. The consortium’s online catalog can be found at www.rvl.info. 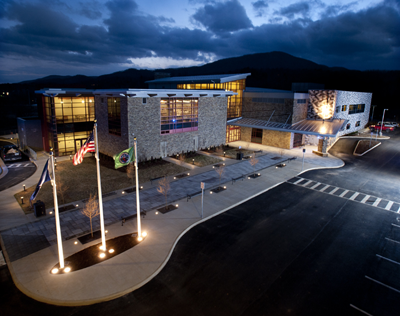 Roanoke County Public Library’s headquarters library, South County, opened on January 3, 2012. South County Library is located on Merriman Road across from Penn Forest Elementary School. In addition to more space for books, computer workstations, and media, the new 54,000-square-foot library features a Teen Center, a whimsical children’s area, a quiet reading room, cozy reading nooks, self-checkout stations, and even a drive-through window for easy pick-up and return of materials. The Commons includes two large meeting rooms, a 200-seat auditorium, a coffee shop operated by Mill Mountain Coffee and Tea, and a used book shop. The Commons can be closed off from the rest of the library to host after-hours events. The new Glenvar Library opened on July 1, 2013, and the new Vinton Branch Library opened November 18, 2015. Adult residents of the area may apply for a Guest Borrower Card at Roanoke College's Fintel Library, or public library patrons may obtain the Library's circulating materials through the Interlibrary Loan program. The Fintel Library offers a collection of over 400,000 total items. The library shares its collection with the Wyndham Robertson Library at Hollins University through a reciprocal borrowing agreement. The libraries at Virginia Tech include holdings of more than 2,634,000 volumes. The University holds the distinction of being a selective depository for federal documents and is an invited member of the Association of Research Libraries (ARL). Adult Virginia residents are extended privileges at Virginia Tech libraries with a Virginia Driver's License or Virginia Identification Card and in-state address and phone number. The Wyndham Robertson Library at Hollins University opened in April 1999 as a state-of-the-art academic library designed to accommodate the full range of information formats, from manuscripts and incunabula to print, microforms, from CD-ROMs to videos, sound recordings, digital videodisks, and multimedia formats to Web-based research sources. At the opening the library was designated the first National Literary Landmark in Virginia by The Friends of Libraries, USA. All of this grew from a cornerstone, first laid in 1908 for the Charles L. Cocke Memorial Library. The current collections of the Wyndham Robertson Library consist of more than half a million items, including books, print periodicals, e-texts, videos, screenplays, rare books, and manuscripts. More than 14,000 journals are available in print or through electronic database subscriptions. In addition, Media Services provides different media formats and equipment, and Special Collections and Archives houses interesting collections and rare materials. Hollins University welcomes all area residents to use the Wyndham Robertson Library. Guests are invited to search the online catalog and to use the library periodicals and government documents within the library. Other local libraries accessible to residents of Virginia include Virginia Western Community College's Brown Library, and the Roanoke Higher Education Center Library.